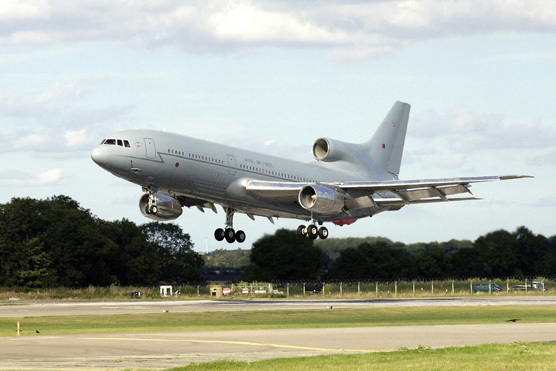 The 3-engine Tristar is a transport and tank aircraft in service with the British Air Force (Royal Air Force, RAF). The Tristar can transport 266 passengers or 160 passengers and 43 tons of cargo. The RAF has 9 of these aircraft in 3 different version. All Tristar aircraft can be refueled by other tankers. Besides they are useful for aero medical evacuation. During recent operations in Afghanistan and Iraq these British aircraft have refueled a lot of aircraft from the United States Navy and the United States Marine Corps. Both defence parts are using the same tank systems. By this system he receiver must positioning his self into a drain to receive the fuel. This in opposition with the aircraft of the United States Air Force which uses a solid boom which is controlled by a operator in the tank aircraft. 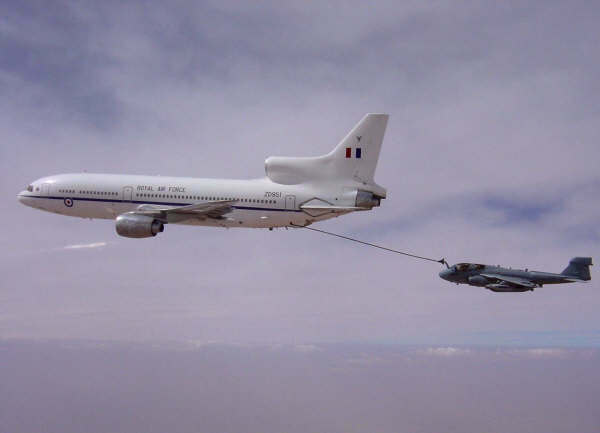 The Tristar KC1 tanker aircraft can transport 160 passengers and 44 tons of cargo over a maximum distance of 5700 miles. As tanker aircraft they can carry 136.000 liters fuel, which can be give to other aircraft with an average of 2000 liter per minute. 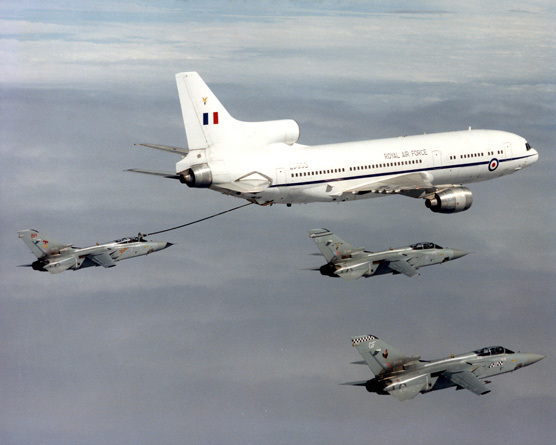 The KC1 can refuel 2 aircraft at the same time. The K1 version is almost the same as the KC1 but has only one point to refuel other aircraft. The C2 and C2A aircraft have a standard configuration to transport 260 passengers and their are having a cargo space. 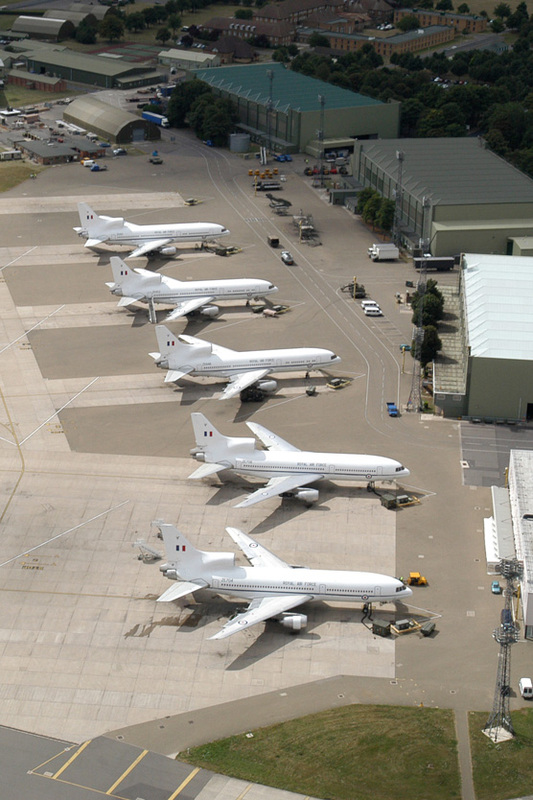 In the name of the Future Strategic Tanker Aircraft (FSTA) program the Tristar aircraft will be replaced by new Airbus A330MRTT aircraft.